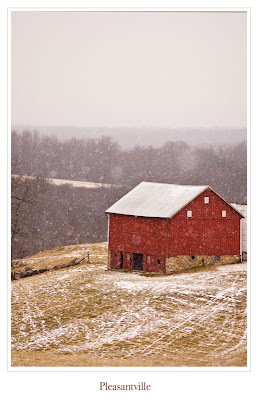 Today, I woke up to a dusting of snow on the trees and the weather forecast was for snow showers so after some breakfast and house chores I decided to go in search of a Red Barn in the snow. 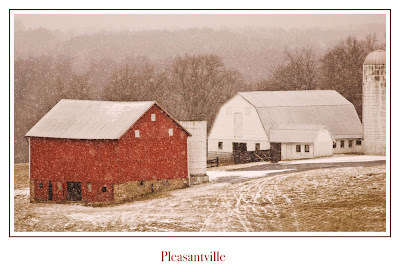 I had been asked last week how fast a shutter speed do you need to freeze snow falling and I didn't have any recent info to refer to and I knew it was contingent on several factors...how fast the snow is falling and how bright is the daylight. This is where digital really is nice. 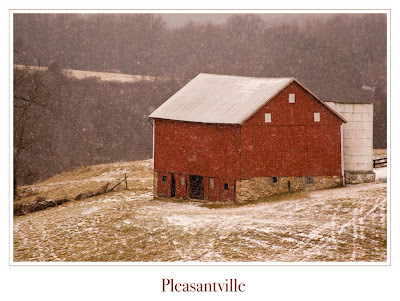 When I spotted the Red Barn and a convenient pull off, I ran a few hand held test shots from the car window. I needed a shutter speed today of 1/1600 of a second at F4 with my ISO set to 400. I would have liked to have had a little more depth of field but the falling snow flattened out the subject in the distance. I only made 20 exposures today, but felt satisfied as I captured the image I was seeking. I got your blog site from Joe's and have to tell you that I absolutely love your work! You have such a fresh view and it’s very inspiring!!! Thanks Ed, appreciate your comments.